conducted through Computer Assisted Qualitative Data Analysis Software using the software Atlas.ti. ferent from that of other populations and subcultures. the sea its lifeblood (Corsi, Esposito, & Meglio, 2012). the fishing of the night is propitious to the new fishing season. debate on environmental issues was neither simple nor prompt. 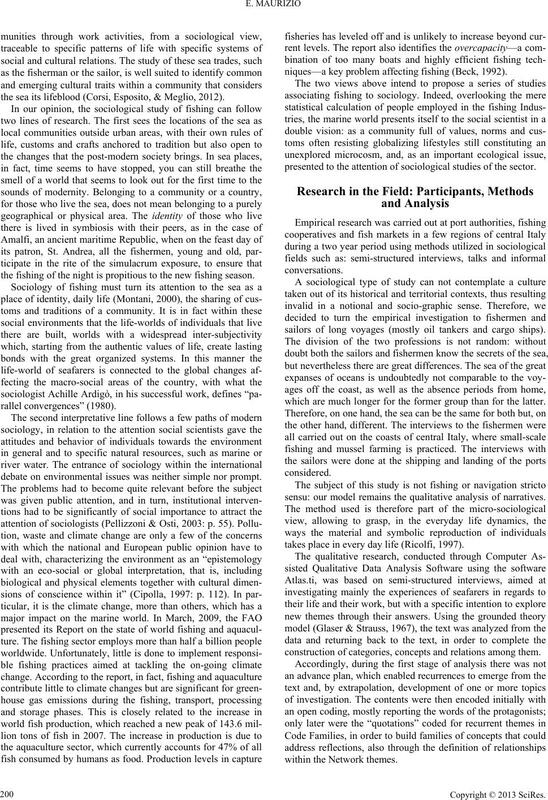 niques—a key problem affecting fishing (Beck, 1992). presented to the attention of sociological studies of the sector. sailors of long voyages (mostly oil tankers and cargo ships). which are much longer for the former group than for the latter. sensu: our model remains the qualitative analysis of narratives. takes place in every day life (Ricolfi, 1997). construction of categories, concepts and relations among them. “fishermen” and “S” for “sailors”. been a family of fishe r me n (Interview 3F). The Boat as a Total Institution? a milestone for anyone interested in marginalization issues. The key concept of this work is that of total Institution. tal grounds: the ships are part of this category. except for the dip of the oars” (Hemingway, 1996: p. 29). (see Mazzacane, 1989: p. 16). tance from the family (Interview 52S). in the best way (Interview 34S). sense of withdrawal, substantially a “retreat” as Lévinas stated. if I could not stand it, I would give it up (Interview 21F). which sometimes shatter like waves on the rocks. 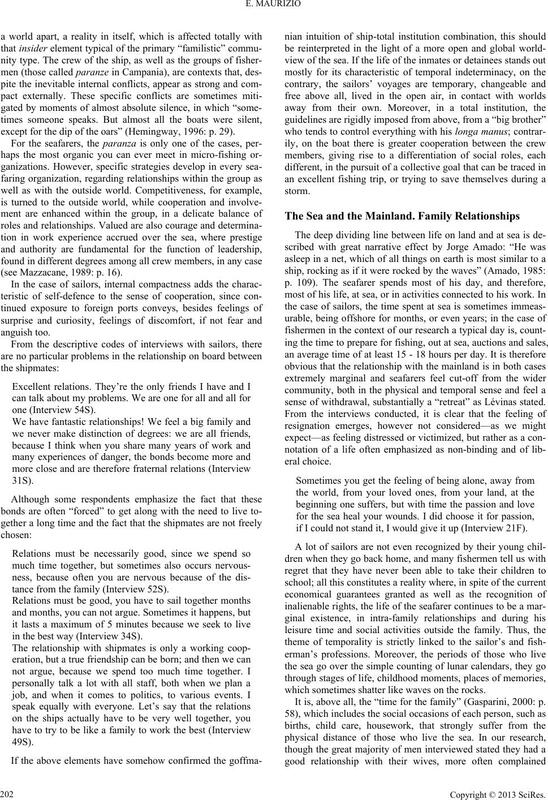 It is, above all, the “time for the family” (Gasparini, 2000: p.
especially for the world of sailors. because she no longer wanted to be alone with the child. 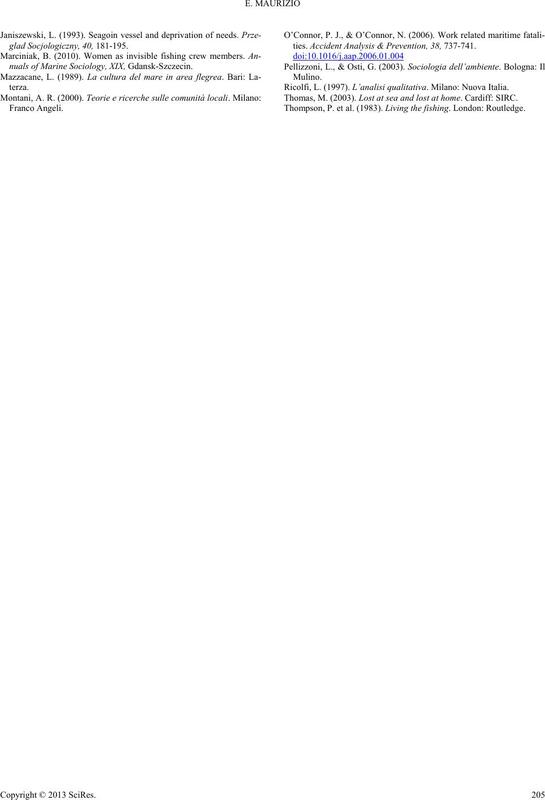 lives” (Giglia, 1989: p. 150). family life during the man’s absence. of resources (Marciniak, 2010: p. 76) . worry, in any case, for the uncertain future. as often we think about the family, with great mela ncholy . mercy of the waves, without being able to control the boat. values such as the family and sense of belonging. stems, branches, leaves, flowers, fruit (see Groth, 1982). Amado, J. ( 1985 ). Mar morto. Milano: Mondadori. Berger, P. L. (1963). 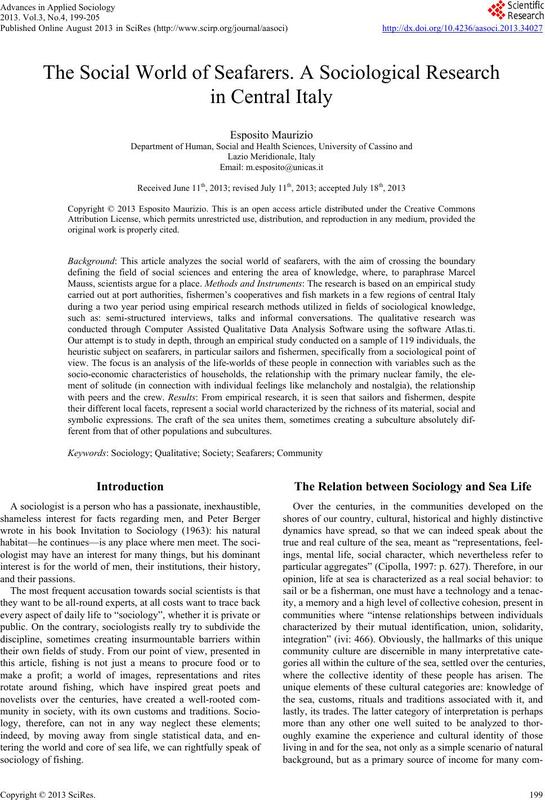 Invitation to sociology: A humanistic perspective. New York: Knopf Doubleday Publishing Group. Braudel, F. (1987). Il mediterraneo. Milano: B ompiani. Comisso, G. (1988). Gente di mare. Milano: Longanesi. mini di mare. Milano: Franco Angeli. confini mobili tra le sfere della vita. Milano: Franco Angeli. FAO (2009). 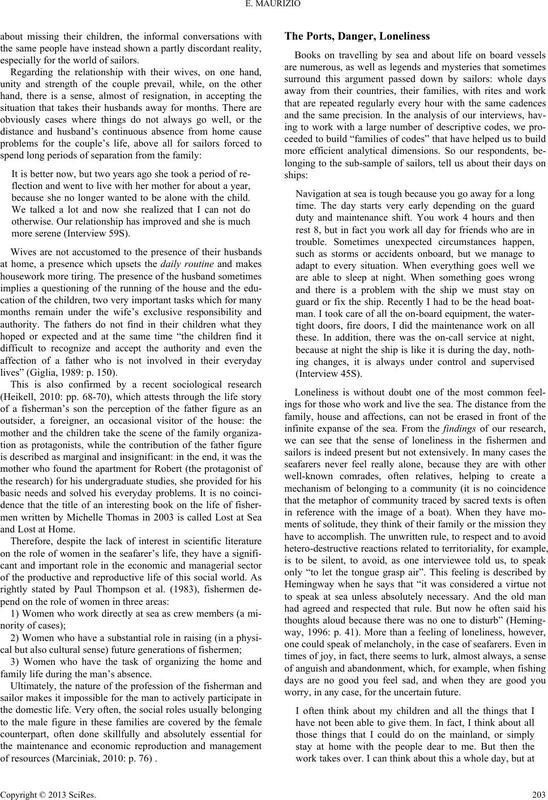 The state o f word fisheries and acquaculture. Roma. zacane, L., Ed., La cultura del mare. Bari: Laterza. Strategies for qualitative research. New York: Aldine De Gruyter. Groth, G. (1982). Toward a sociology of fishing. R ural Sociologist, IV. Hemingway, E. (1996). Il vecchio e il mare. Milano: Mondadori. nuals of Marine Sociology, XIX, Gdansk-Szczecin. ties. Accident Analysis & Prevention, 38, 737-74 1. Ricolfi, L. (1997). L’analisi qualitativa. Milano: Nuova Italia. Thomas, M. (2003). Lost at sea and lost at home. Cardiff: SIRC. 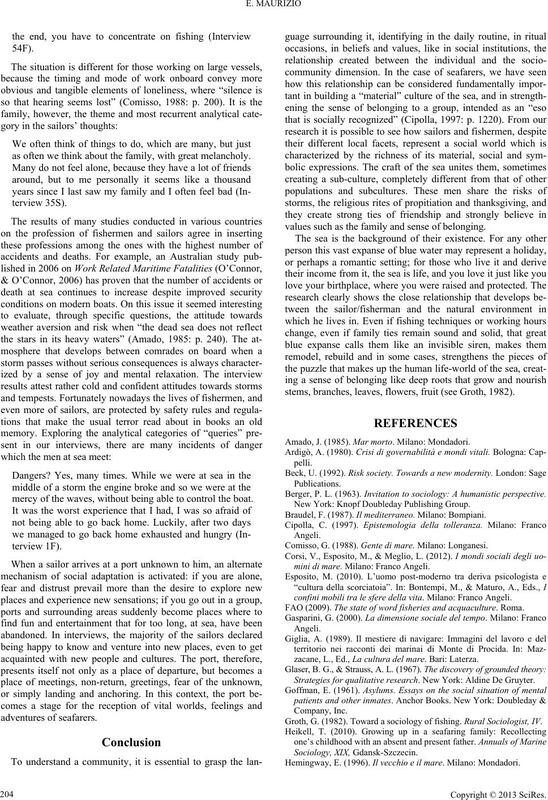 Thompson, P. et al. (1983). Living the fishing. London: Routledge.